“There are many talented musicians in the world, but only a very few have that extra special something… the ‘x-factor’… Marco Marconi is one of these few; from the moment that his hands touch the keys of the piano, he moves into his own stream of jazz consciousness and takes the listener with him into that wonderful world. Marco was born in Umbertide, Umbria in the delightful province of Tuscany. His musical career started in 1989 with his first live performance at the age of 14! Studying privately, he went on to get his first diploma in classical piano in 1997. After winning several competitions and performing regularly in the classical arena, Marco went on to discover the incredible world of jazz. Adapting his wonderful technique and intuitive talent, he started to study with Ramberto Ciammarughi, himself an exceptional pianist and composer, well known on the European jazz scene. Marco swiftly became a jazz appassionato and went on to gain a second diploma - this time in Jazz in 2005 at the Conservatoire of Perugia, under the tutorlage of Paolo Di Sabatino. April 2008 saw Marco complete his post graduate studies in jazz, achieving maximum votes and securing his Doctorate in Jazz. By now a rising star in the Italian jazz world Marco was invited to make a solo recording at the Fazioli Concert Hall near Venice, becoming one of only a handful of Italian artists to have had this opportunity since the hall was opened in 2005. Fast becoming the top piano maker in the world, Fazioli Pianoforti have constructed a special concert hall complete with the latest acoustic features and the incredible Fazioli grand piano, an F278, making it perfect both for concerts and recordings. 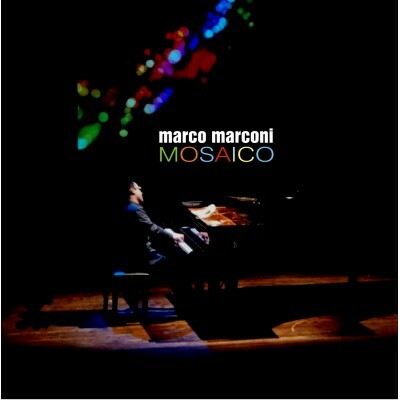 Recording Mosaico was a huge challenge and Marco decided to make an album that included different moods, rhythms and tempos, including well known jazz standards and his own compositions, reflecting the different aspects of his personality and of his musical studies, classical and jazz – indeed a wonderful Mosaic of music. Happy with the recording, Marconi said “The bass notes on this sublime instrument have an incredible volume and depth and the top notes shine like lights. I had to get used to this dynamic pretty quickly but I could have played that piano for days!” Marco feels that Mosaico reflects his character and artistic soul, both personally and musically. This certainly comes through in the music on these ten tracks, from the Latin groove and swing of the opening Caravan, to the haunting melody of his original PhilaNthropy (dedicated to Paul Newman), to the ultimate breathtaking, gentle softness of What A Wonderful World, and on to his blistering rendition of Take Five - the Paul Desmond/Dave Brubeck masterpiece. Marco made a highly successful UK debut at the Cheltenham Jazz Fringe Festival leading the organiser, Stefan Edwards to say "Marco's performances were the highlight of the festival". Subsequently, Marco has had performances at both the Umbria Jazz and Film Festivals, the Monterchi Festival, Arezzo Jazz and at the Festival dei Saraceni in Turin where he wrote and performed an original composition called ‘Lord Byron’ using medieval Saracen influences! As a jazz piano soloist Marco regularly performs now in the UK & Italy at concerts, events & festivals. He has also formed his own Trio and the line up now includes highly respected and talented artists Andrea di Biase (double bass) and Enzo Zirilli (drums). Since signing with CANDID this Trio has recently made its debut recording-like Mosaico at the renowned Fazioli Concert Hall, which will be his next release on the label.